On 4 August 1914, the German staff launches more than 700,000 men on the assault of Belgium. The 2nd German army, commended by General Karl von Bülow, reached Maubeuge passing through Belgium. The aim was to invade France and to topple Paris. The 5th French army was commended by General Charles Lanrezac. The meeting of these two armies occurred from 21 to 24 August at various locations on either side of the Sambre. On 22 and 23 August 1914, soldiers from the 18th French corps defended the bridges on the river Sambre. On 23 August 1914, at dawn, French soldiers halted the approach of the German army on the left bank of the Sambre. In the afternoon, the French brigade surged back to the south of Biercée while the Germans infiltrated the right bank. Despite the greater number of the Germans, the French army inflicted heavy losses on the enemy camp. In the evening, General Sordet’s cavalry corps retreated toward the south. With the village in flames, the inhabitants attended to the injured and buried the dead. World War I led to great destruction in agriculture and industry, as well as huge losses of human life. The considerable physical damage that occurred during the war hit housing, factories, and transport infrastructure such as bridges, roads, and railways very hard. To counter the advancing German army the French soldiers used all the civil engineering works at their disposal to best advantage. Bridges in particular were often used to slow the German advance down. Lobbes has four bridges. On Saturday, 22 August 1914, a French officer, Lieutenant Cotinaud, was given the mission of defending the right bank of the Sambre. The mayor was asked to leave the streets on the left bank lit up. The inhabitants were warned that the drawbridge would be raised and anyone who had crossed over to the right bank would have to remain there. The stationmaster was told to stop all train traffic. The two metal railway bridges were barricaded with overturned wagons and the metal roadways were unbolted. The German army was sighted on the outskirts Sunday morning. By midday, the generals ordered the line of defence to fall back to the plateau. 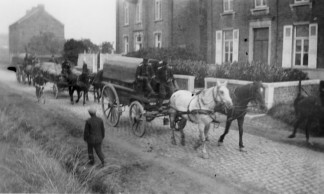 The local Red Cross officers had to grapple with various difficulties in evacuating the wounded. The situation called for the cooperation of the local residents, who took in several wounded soldiers. 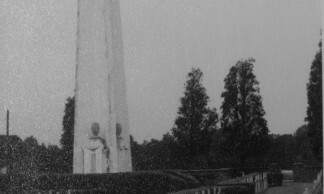 After the war, great friendships grew up between the inhabitants of Lobbes and the families of the wounded soldiers, most of whom came from south-western France. The Feldgrau (grey-green) German uniform faded nicely into the background of the countryside. The French uniform with its red pants could spot more easily by enemy. Both uniforms changed constantly throughout the war. The German Gewehr 98 was a quick-loading breech loader (5 cartridges at the same time). Whilst the French Lebel – an 1893 revision of the Lebel 1886 – was very accurate, it was slow to reload (cartridge by cartridge). The German haversack weighed about 15 kilos. It contained a tent canvas and stakes, a blanket, mess tins, a flask, cutlery, and survival rations. The French haversack weighed twice as much, that is, nearly 30 kilos. It contained clothing, spare shoes, a toiletry kit, a tent canvas and stakes, survival rations, and so on. 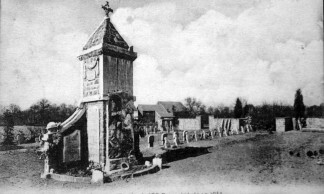 During the occupation, the German authorities set up a military cemetery of which only the surrounding wall and urn decorating the entrance gate remain. 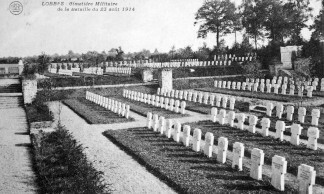 The corpses of the soldiers who died during the fighting in Lobbes were buried in this cemetery. Before it opened, the bodies had been stored in temporary mass graves. 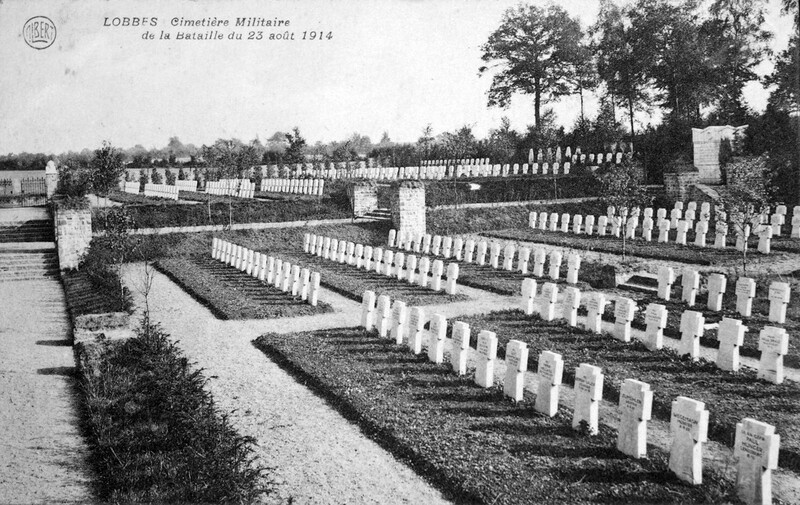 The current military cemetery contains the remains of 226 French soldiers. In addition, it boasts a magnificent beacon monument symbolizing the great esteem in which France’s soldiers are held. 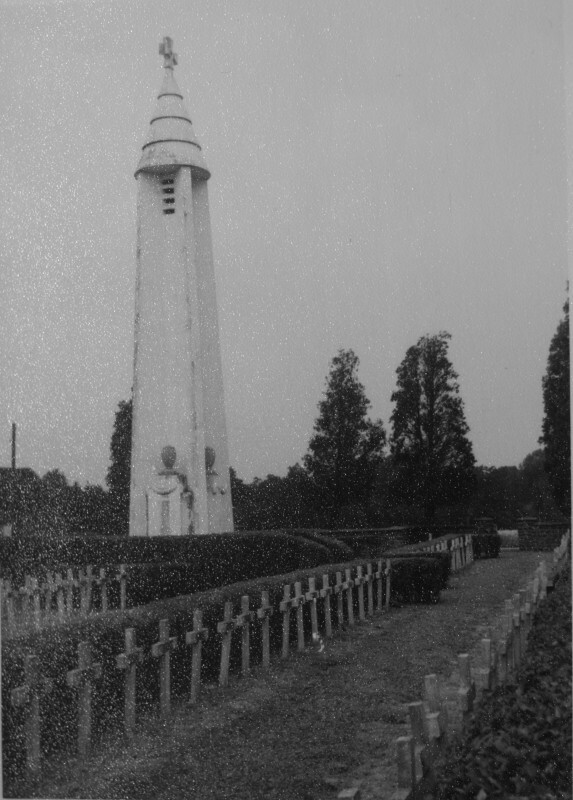 Many of the soldiers buried there came from the regions around Bordeaux and Paris, Brittany, and Vendée. In parallel, a few families built memorials for their brothers, sons, and/or husbands fallen in combat. 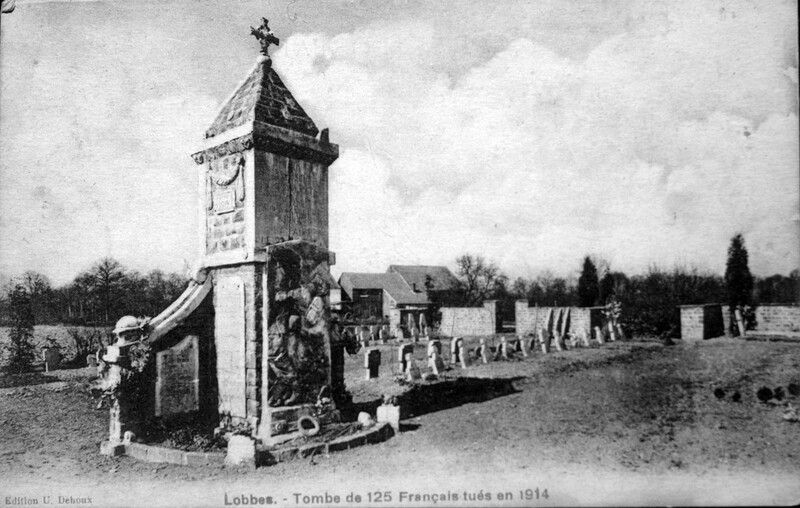 On 17 June 1920, Eugène Thomire bought a 75 square metre plot from Fernand Copée to build this monument, which still stands, in memory of his brother, who was killed on the battlefield at Lobbes. In the valley, a railway crosses over many of the loops of the Upper Sambre River. In 1914 the Paris-Cologne express plied its tracks. After the battle of Lobbes the German trains waited for the bridges to be cleared. That was done with due diligence to enable the Germany heavy artillery to be positioned for a siege on the fortress of Maubeuge. The German Chiefs-of-Staff, who lodged in the mayor of Lobbes’s home, foresaw a two- to three-day stay. In actual fact, General Fournier, who commanded the fortress of Maubeuge, defended his position staunchly for two weeks. As a result of this unforeseen resistance, the German reinforcement trains were stopped in the station at Lobbes before heading south via Chimay. Wilhelm II’s army was detailed to keep the tracks and engineering works along the railways intact everywhere they went. Sometimes long trains of more than fifty closed railway cars of wounded soldiers or prisoners rolled past in the opposite direction. One such train went by on 30 August.